Bioscopists in the UK will certainly not want to be anywhere other than in front of their television sets on Thursday 18 August at 9pm, when episode one of the fourt-part series The Story of British Pathé is broadcast on BBC4. 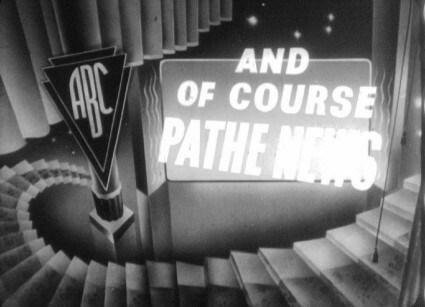 This is to be a series not so much on the history of a newsreel, but rather of a collection (there never was a newsreel called British Pathé, but there is an archive of that name which includes the newsreels Pathé Gazette, Pathé News, and much else besides). The four episodes will cover the birth of the news, the voice of Pathé, Pathé’s cinemagazines, and the travelogues and docuentaries in the collection. Dates have not been given for the second, third and fourth programmes, but let’s assume that they will be broadcast on succeeding Thursdays. All of the archive footage to be featured in the programmes can be found on the British Pathé site itself, one of the great treasure troves of archive film to be found online (both silent and sound), already trumpeted by the Bioscope on more than one occasion. It going to be very interesting to see what the programme makers make of a collection which has so often supplied essential content for television but has never been (to my knowledge) the subject of a programme itself (the celebrated Granada Television series All of Yesterdays used mostly Pathé footage but wasn’t about Pathé). It won’t be a regular history, I suspect, but I’m hopeful of seeing new insights from a production team that was largely new to this sort of material. And you may get a glimpse of two of your scribe, unless everything they shot ended up on the cutting room floor (not an impossibility, given my usual tongue-tied performance whenever anyone has the nerve to point a camera at me). As usual, the programmes will be available for a week afterwards on iPlayer, for people in the UK only. Do let us have your thoughts about the programmes. …”for people in the U.K. only”..(whine). Alas, and always to be so – or until the whole world starts to pay the BBC the licence fee. The promised global iPlayer won’t be quite the same thing – a subscription service offering a showcase of BBC programmes old and new (http://www.bbc.co.uk/news/technology-14322604). Well, I thought they made quite a good job of it. Episode one covered the history of the newsreel, going chronologically through Sidney Street siege, 1913 Derby, WWI, shell shock, pirating, Jarrow marches, appeasement, WW2, Belsen, new political awareness shot down when audiences reacted against it, royalty, rise of TV, Suez and swinging Sixties. It got the key points across about how the newsreels operated, and it didn’t look down on them at all, though more might have been said on what the newsreels did well and why they were so popular. Some small historical slips were there to bother only the pedants. I was surprised to see film of German film pioneer Max Skladanowsky being used to illustrates Charles Pathé’s entry into the film business, and the ‘over the top’ sequence from The Battle of the Somme was not shot by Pathé (I told them this but they used it anyway). And the assassination of Alexander, the King of Yugoslaia, was shot exclusively by Movietone’s Georges Mejat. Some disappointment too that they missed one of my favourite newsreel coups, even though they showed the footage. Pathé missed out of the rights to film the 1923 FA Cup Final at Wembley, rights which were purchased by Topical. So Pathé hired a plane to film from Wembley from above, only Topical got wind of this and plastered their name all over the Wembley roof, which Pathé could not help but film. The clip was shown but not commented on. Shame. But a good programme generally, with proprtionate coverage of the silent era. I’m looking forward to episode 2 next week.